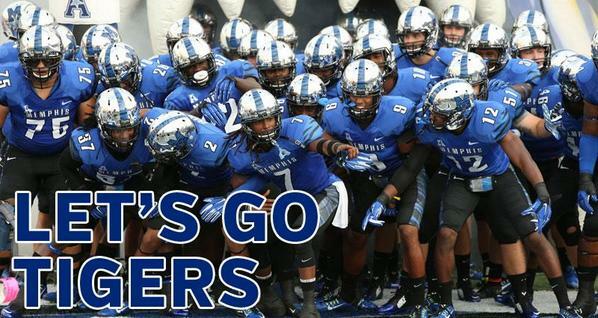 You've likely heard the hype. 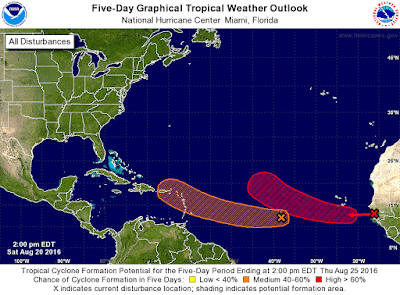 A tropical wave that has not yet formed into a storm is "bearing down on the Caribbean" and sure to pose the gravest threat to the United States since Twitter was born. Millions are in the potential path! 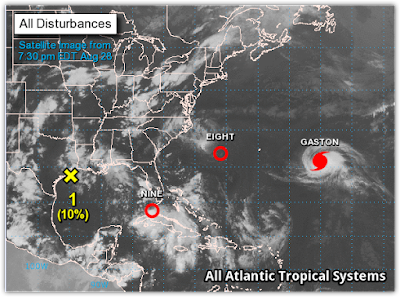 Maybe you've even heard of a "triple threat" to the U.S. because there are two other storms in the Atlantic, even though they have virtually no chance of reaching American shores. Tonight I thought I would take a few minutes to explain why responsible meteorologists (as I consider myself to be) can't, and won't, predict what the yet-unnamed tropical cyclone approaching the Caribbean is going to do. It's part of the education process I engage in with MemphisWeather.net, particularly because I display the Weather-Ready Nation and NWA Digital Seal logos that mean I am a responsible purveyor of weather information. But first, why even bring this up? We aren't near the coast, so why does it matter? Because I get your questions and answer almost all of them! "What does the European model say today? It's always right!" Also because many of us have interests in near-coastal locations - relatives, friends who have moved, or maybe even our favorite beach spots. The Mid-South is also near enough to the central Gulf coast that when a big storm heads that way, we need to pay attention. 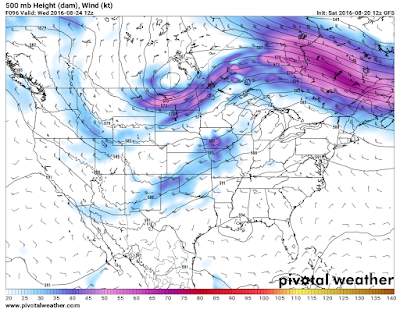 If it doesn't directly affect our weather, it likely will indirectly. So here's the problem. A tropical wave that is still a few clusters of thunderstorms, with no "closed circulation" (meaning it is not yet an actual low pressure system), is not well-observed by the computer models. And if it's not well observed, it isn't going to be well-forecast. There are simply too many variables, including whether or not it will actually form and then how strong will it be and where will it go. 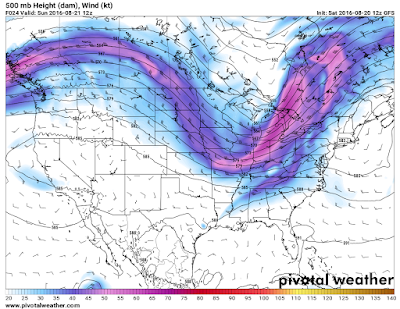 Models, and the human "interpreters" that forecast these systems, are getting better, but it's still very difficult especially in the early stages of a system. Look at these examples from today. Here's this evening's model "spaghetti plot." It looks like a pot of noodles! 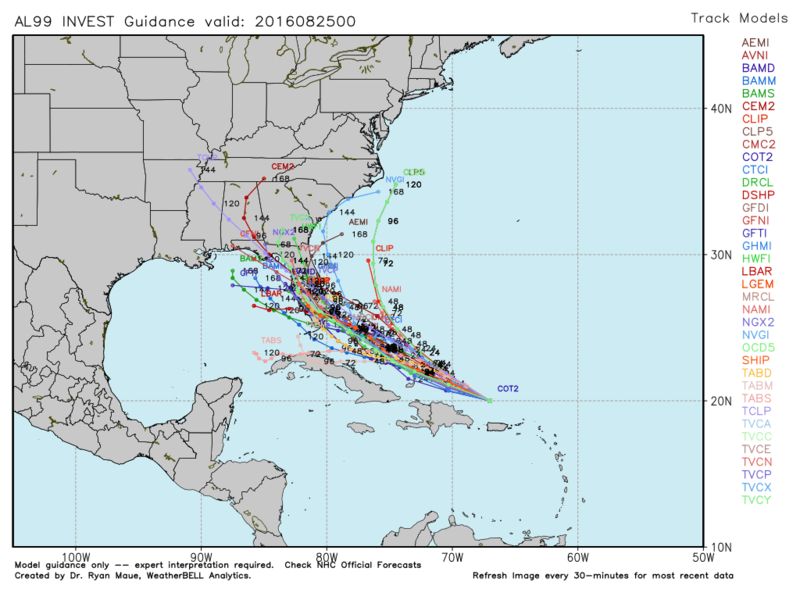 The colored lines are forecast tracks of this particular system by various computer models. The tighter they are together, the higher the confidence in the track as they all have roughly the same solution. The farther apart they diverge, the lower the confidence, because the solutions are very spread out. In this case, a couple models say the system will miss the east coast altogether while a couple point it towards the mouth of the Mississippi River. In other words, the "spread" of the models doesn't tell us who should be preparing for the storm! 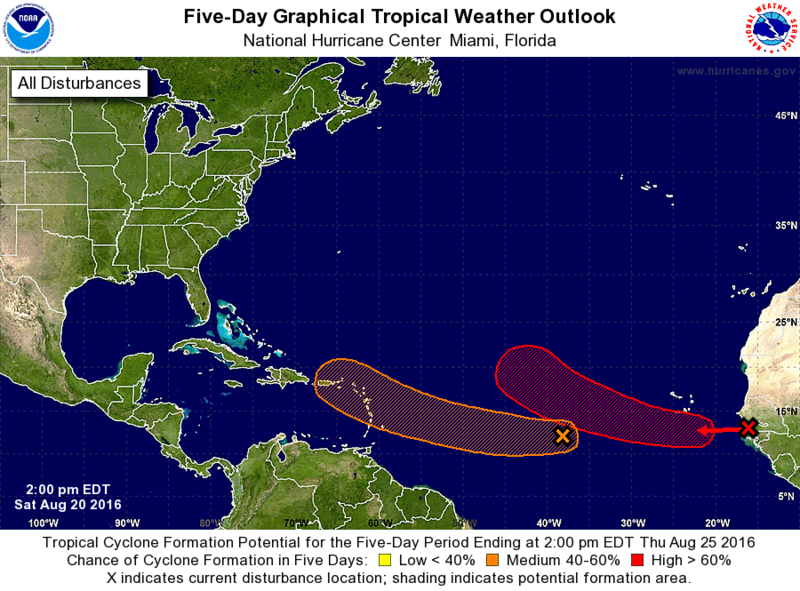 Sure it looks like southern Florida has the best chance, but when? And how strong will it be? And then where does it go?? The next graphic shows the forecast strength of the system, going out in time. What does it tell me? That we could have a system that remains a weak tropical depression with little impact other than rain for the next week, or we could have a category 4 hurricane in 5 days! 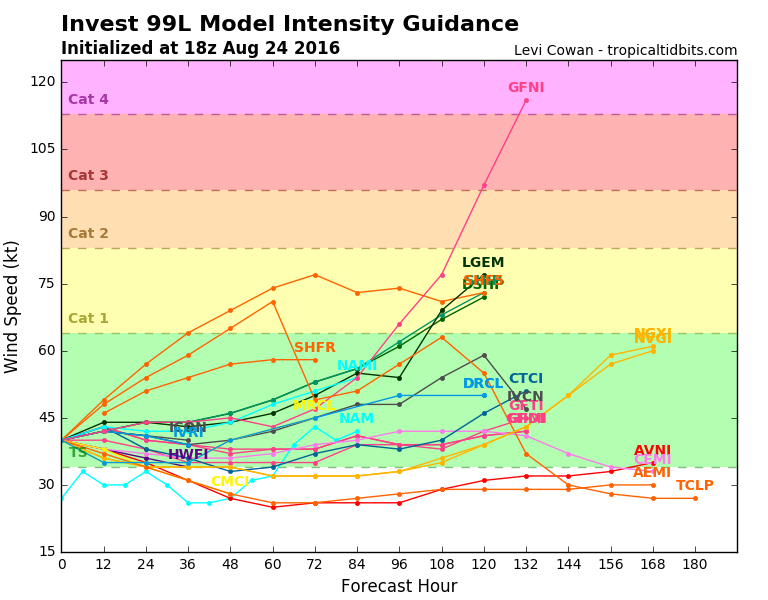 The models don't have any idea, even if you throw out that aggressive GFNI model. 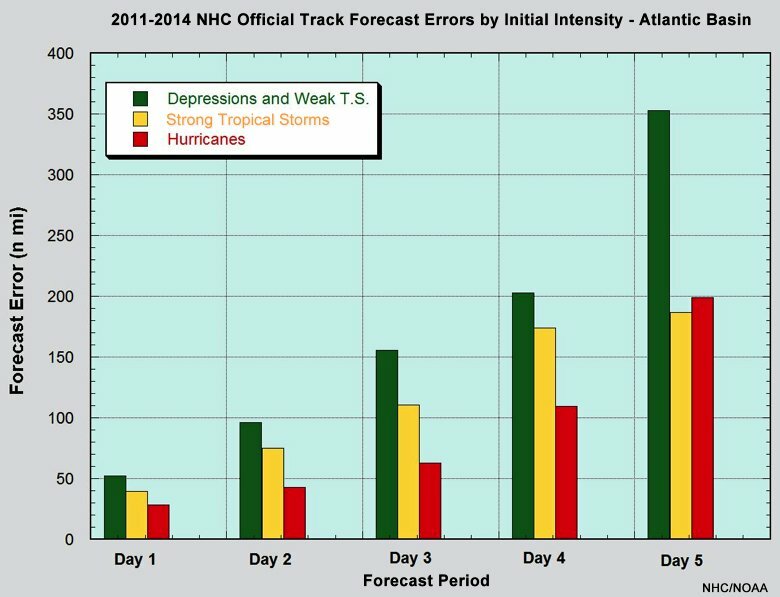 What does history tell us about how well the forecasts from the National Hurricane Center (you know, the "experts" at this stuff) pan out? See below. Forecast error is on the left (vertical) axis and time is along the bottom. 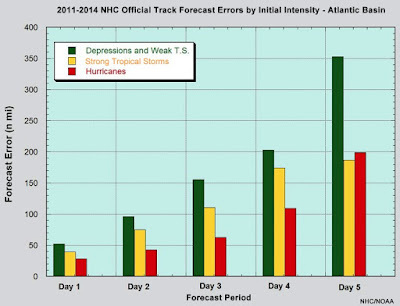 Each colored bar represents a certain type of storm based on intensity. As you can see, the weaker the system being forecast, the worse the track error is, especially as you get further out in time. The average error for a weak system at 5 days is over 350 miles! And these are the experts that interpret all the data, not the models! 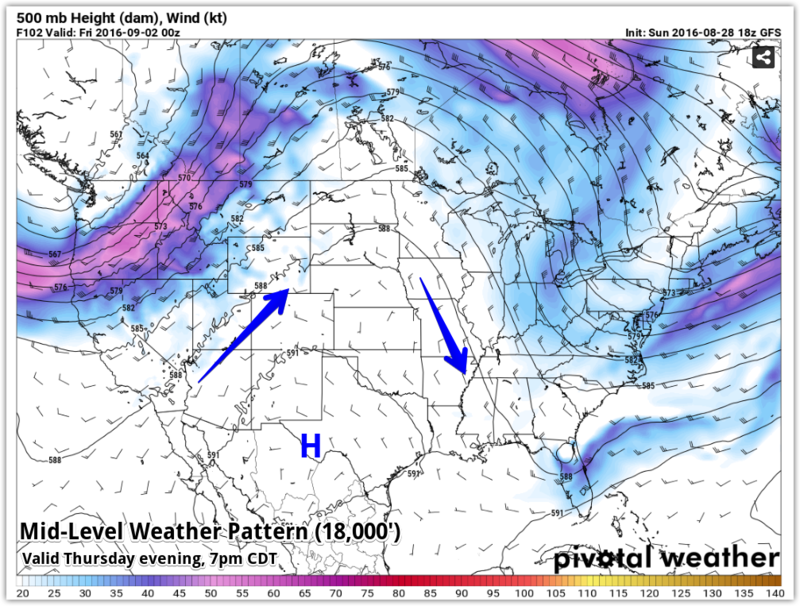 The only time we post longer-range forecasts is if there is A) some model consensus & B) it's within about a week. Even then, with caveats. Thanks for making MemphisWeather.net one of your trusted sources! I'll continue to work diligently to ensure that trust is not broken, including saying "I'm not sure" if I'm not. Stay tuned to our social media feeds listed below for the latest "truth without the hype" outlooks and forecasts. Louisiana low produces record rain, but what about our precip chances? You've no doubt seen the media reports of flooding that is rising to historic levels along the central Gulf Coast. It started earlier this week with a low pressure system that formed in the northeastern Gulf and brought heavy rain to western Florida and now has been sitting over Louisiana the past 24 hours. The situation in some areas of southern Louisiana, mainly west of New Orleans, is becoming dire as water rescues have been necessary and portions of towns and cities are flooding from 10-20" of rain that has fallen so far. Baton Rouge received over 11" of rain in the past 24 hours, which forced Louisiana State University to close today on what would have been move-in day for students and the governor has declared a State of Emergency for the entire state. Unfortunately, today brings another day of heavy rain in some of the same areas. The low is centered over west-central Louisiana this morning and is combining with abundant atmospheric moisture fed by anomalously warm waters in the norther Gulf of Mexico to produce very high rainfall rates of multiple inches per hour in the heaviest storms. 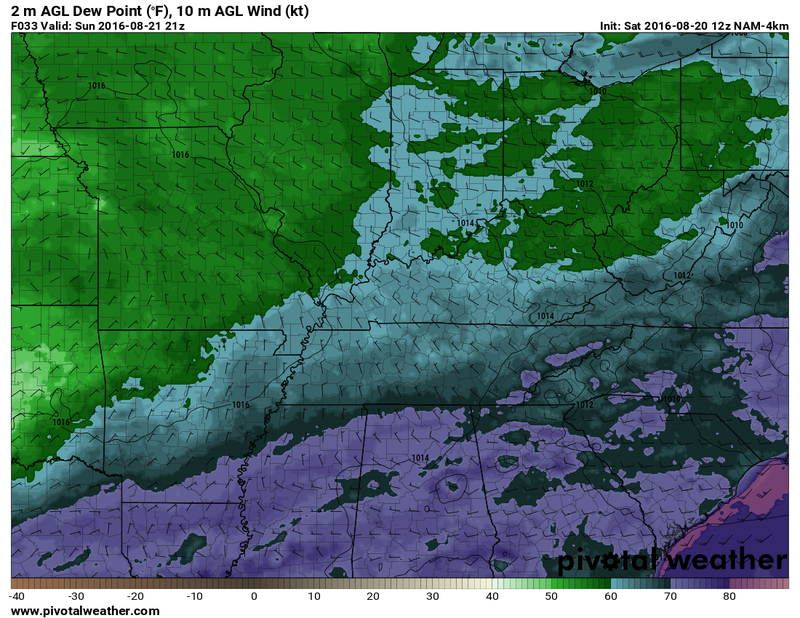 With respect to how how this system affects Mid-South weather, the effect is indirect, as the low moves very little, into northwest Louisiana by Sunday morning. 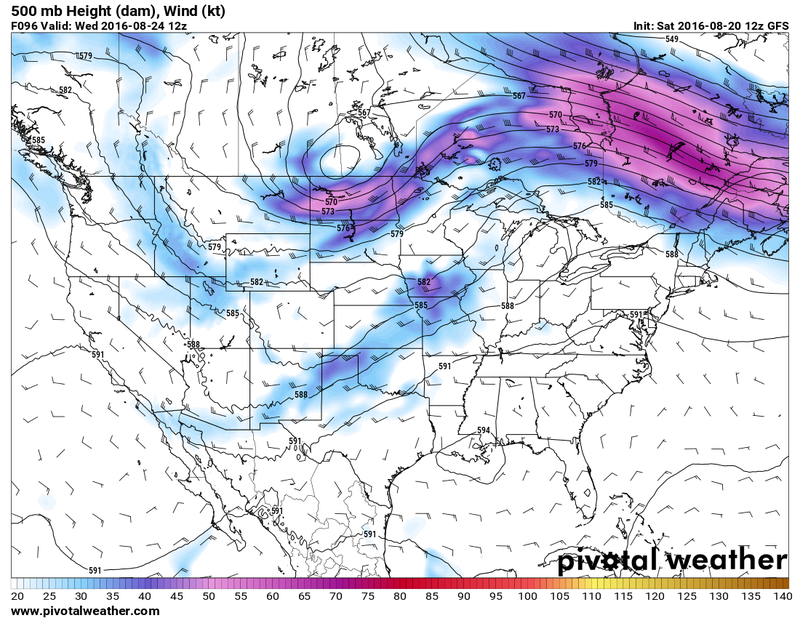 However, it will weaken a bit and merge with a frontal system that is loitering to our northwest. The front will move little, but act as a conveyor belt for the energy and rainfall from the low to move along the front northeast into the norther Mid-South and then the Ohio Valley. NWS surface map valid 7pm Sunday evening shows weak low pressure over eastern TX as it gets ready to start it's journey northeast along the front that is draped out just to our north and into the Ohio Valley. 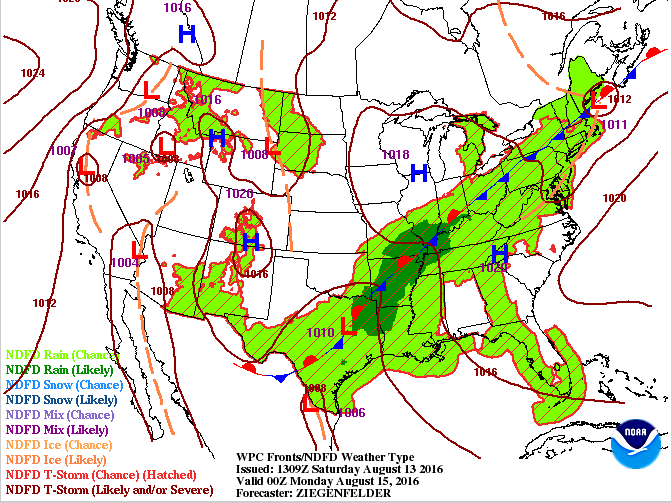 That front will be the focus for the heaviest rainfall into next week. With the metro sitting firmly in the "warm sector" south of the front, the proximity of front to the northwest, the low to the southwest, and upper level energy moving over the area will mean scattered showers and a few thunderstorms mainly during the warmer parts of the day this weekend with most people seeing a good chance of rain, especially Sunday and Monday. Abundant moisture is in place overhead, which means that any showers or storms that form will be capable of heavy downpours. Fortunately, showers and thunderstorm won't be sitting in one place very long, which should reduce the flash flooding threat this weekend in the metro. 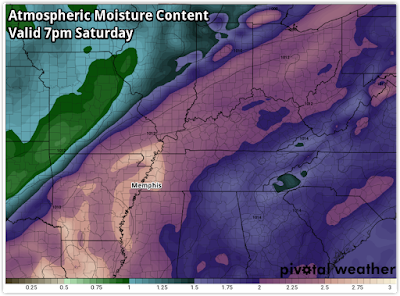 Precipitable water values, which measure total atmospheric moisture in a column of air, will be very high this weekend, meaning any showers and thunderstorms that form will be capable of heavy rain in a short period of time. Values of 2" are considered very high and 2.5" excessive. 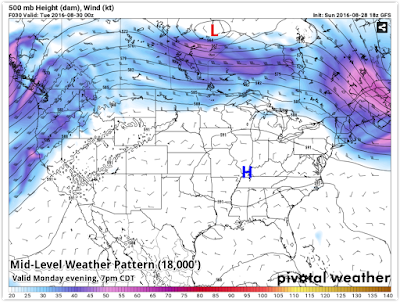 Graphic courtesy PivotalWeather. Closer to the front though, from northern AR into southern MO, rain and storms could "train" over the same areas repeatedly, thus setting the stage for higher risk of flash flooding. NOAA/NWS forecast rainfall amounts through Monday evening indicate where the plume of heaviest rain to our west, although we could see more than an inch of rain the next couple days. Graphic courtesy WxBell. 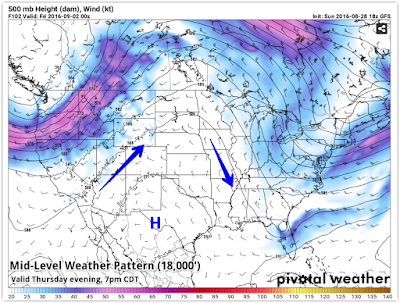 Heading into next week, the weather pattern remains stagnant as the front sits just to our north. Rain chances remain at least 50/50 each day through at least Thursday. This wet pattern will mean a couple of things. First, periods of heavy rainfall will be possible each day, which will make up for our recent dry weather that for some is now going on two weeks. Heading into next week, NOAA/NWS forecast rainfall amounts continue to build in the Mid-South and northward through the Ohio Valley into the northeast. Total amounts through Friday morning are shown, indicating 3-5" possible in the metro in the coming week. Graphic courtesy WxBell. Also, temperatures will remain warm and humidity high, but we're not expecting to see 90° again for much of the next week. 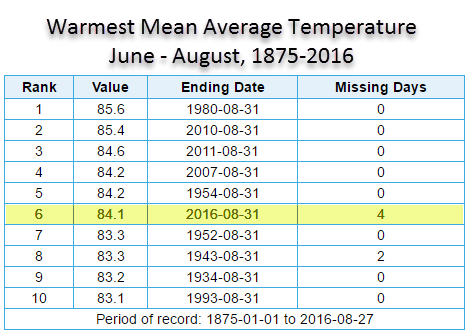 That may mean an end to the second-longest streak of daily average temperatures above 80° in the next few days. 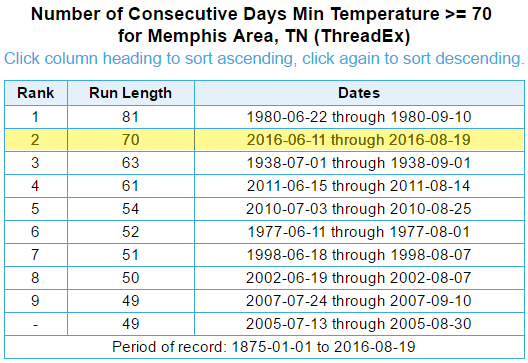 It currently stands at 64 days at Memphis International Airport. We also are in the midst of a stretch of 77 days with high temperatures at or above 85°. 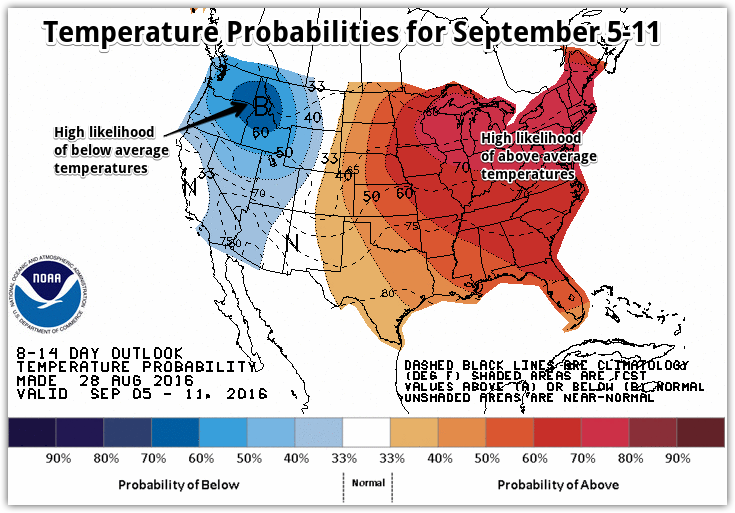 There's a good chance that will be broken in the next week as well with highs forecast in the mid 80s for much of next week. Finally, our streak with no temperatures in the 60s also stands at 64 days as of today. 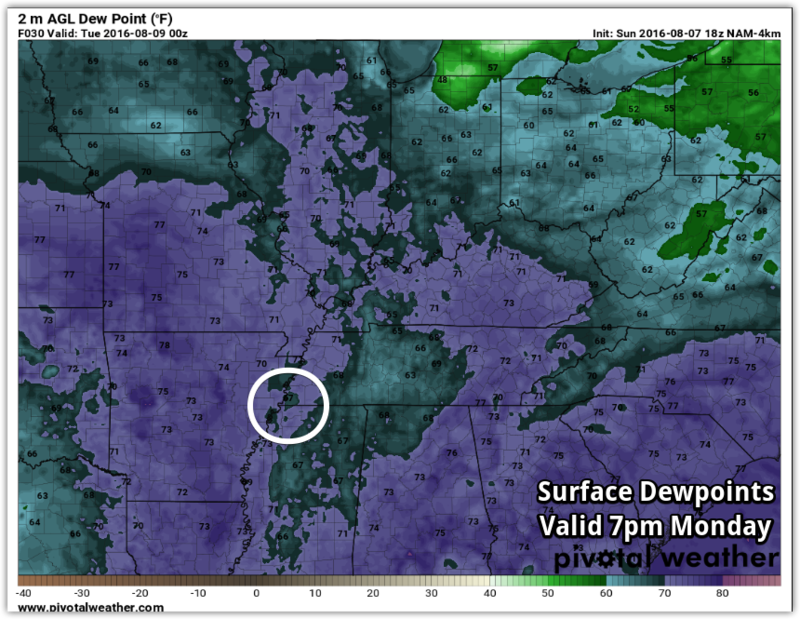 The fact that dewpoints will remain above 70 during this wet week ahead will likely keep that second-longest such streak intact. 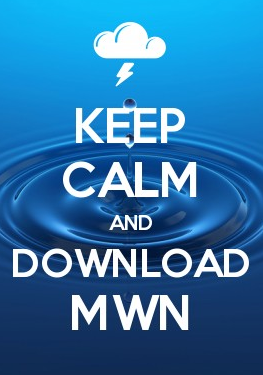 Stay up to date with our latest forecast information and Mid-South radar via the MWN mobile apps or our website and social media streams. Links to all are provided below. A potential reprieve from summer heat is on the horizon and I doubt anyone is complaining! A broad area of low pressure has developed along the central Gulf Coast and will very slowly move northwest towards and through the Mid-South over the next several days to perhaps a week, bringing a prolonged period of elevated rain chances. In addition, high temperatures will start to recede a bit, though that will partially be offset by increasing humidity as very moist tropical air invades the region after lower humidity to start this week. We'll see a couple more days with temperatures in the lower to mid 90s and heat indices above 100, but scattered afternoon thunderstorms will provide some folks some relief late in the day Wednesday and Thursday. By this weekend, rain becomes likely at times, resulting in somewhat cooler, but humid, conditions. The main threat from showers and thunderstorms the next several days, particularly this weekend and perhaps early next week, will be heavy rain and potential flash flooding as the low pressure system merges with a cold front that moves into the region. The axis of the heaviest rain is still to be determined, but the potential for 3-6" of rain through early next week exists across portions of the Mid-South. Severe weather is not currently expected the next several days. Computer models still diverge quite a bit on when the most likely rain period comes to an end as the low moves northeast out of the region along the front, ranging from Sunday to perhaps as late as Tuesday. That will also affect rainfall totals with more rain likely if the low lingers. 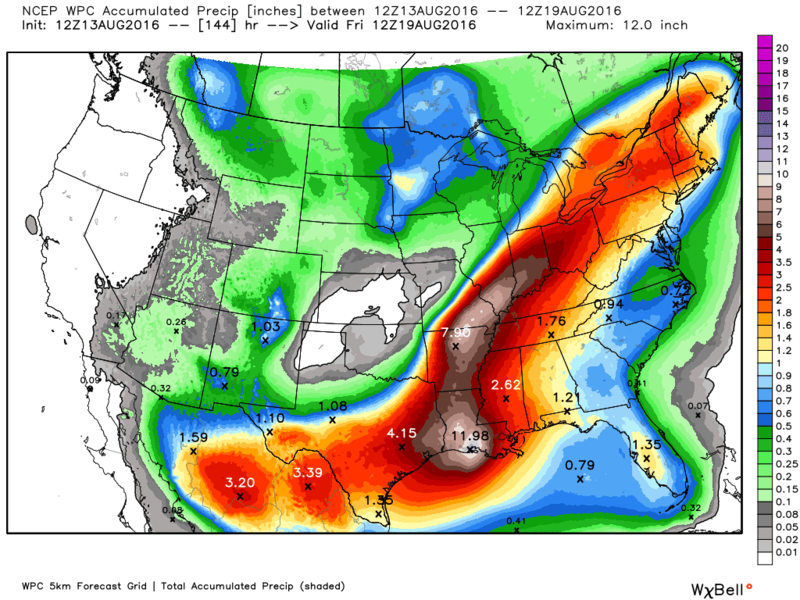 NWS forecast total precipitation for the upcoming week, through Tuesday night, August 16. 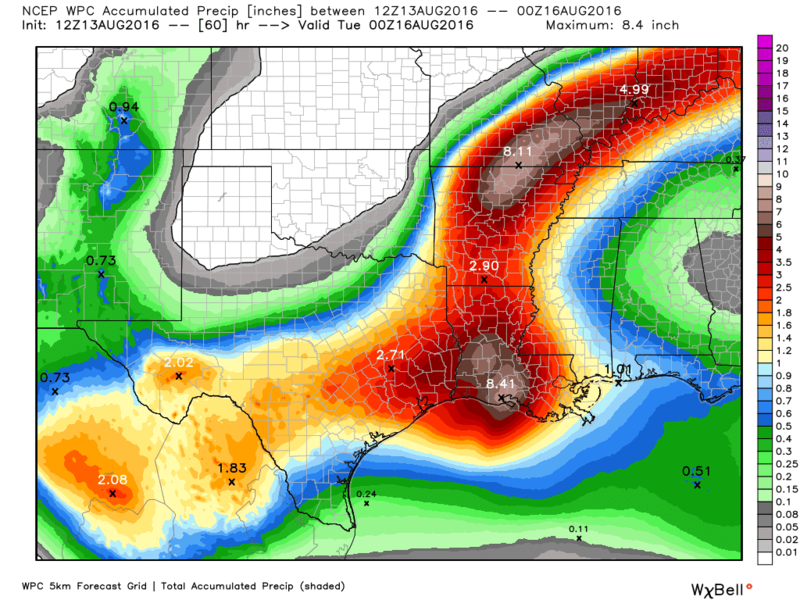 Heaviest rain will fall along the central Gulf Coast, though amounts of 3-6" are likely where the low intersects the approaching front early next week, currently depicted from AR northeast through the Ohio Valley. Besides some needed rainfall, the best news out of this forecast is probably the highs in the 80s, even if lows remain in the 70s due to abundant moisture and high dewpoints. We'll take a break from the 90s any way we can! For a complete look at the forecast, including daily rain chances and temperatures, download the MemphisWeather.net app or visit the MWN website. Not Memphis weather related, but very interesting nonetheless, especially if you frequent Gulf beaches on vacation! Dr. Philip Klotzbach, an expert in tropical research and forecasting at Colorado State University, offered some interesting facts on the records being broken due to an nearly unprecedented lack of hurricanes to affect the U.S., as reported in a Denver Post article. 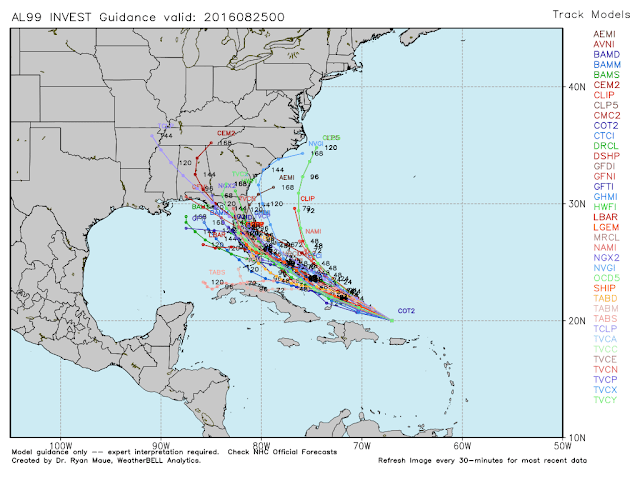 After a devastating string of storms in 2004-2005, in which seven storms that included Katrina, Rita, and Wilma struck the state in 14 months, the Gulf has been very quiet as it relates to these powerful storms. A satellite montage of the major storms of the 2005 hurricane season, provided by NASA and NOAA. 1. Major hurricanes are those with 111 mph wind or stronger (category 3-5 on the 5-point Saffir-Simpson scale). A major hurricane has not made landfall on the U.S. East Coast or Gulf coast in 3,940 days - more than a decade - which is longer than the previous such record streak by almost 2 years! (Sandy was a "post-tropical cyclone" when it hit New Jersey in 2012, though it had category 1 strength wind.) The last major hurricane landfall was Wilma in October 2005. 2. After being battered in the mid 2000's, the state of Florida hasn't had a hurricane landfall (any intensity) since Wilma in 2005. The state averages 7 landfalls per decade and the current record is nearly twice as long as the last hurricane-less streak of 6 years (1979-1985). 3. Even more amazing are the number of chances there have been for Florida to be struck in that "hurricane drought." 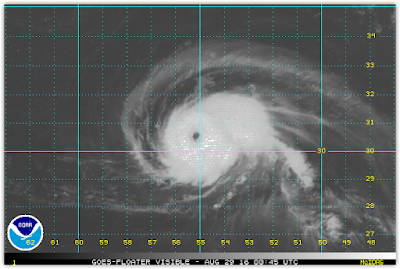 67 hurricanes (27 majors) have formed in the Atlantic since Wilma! 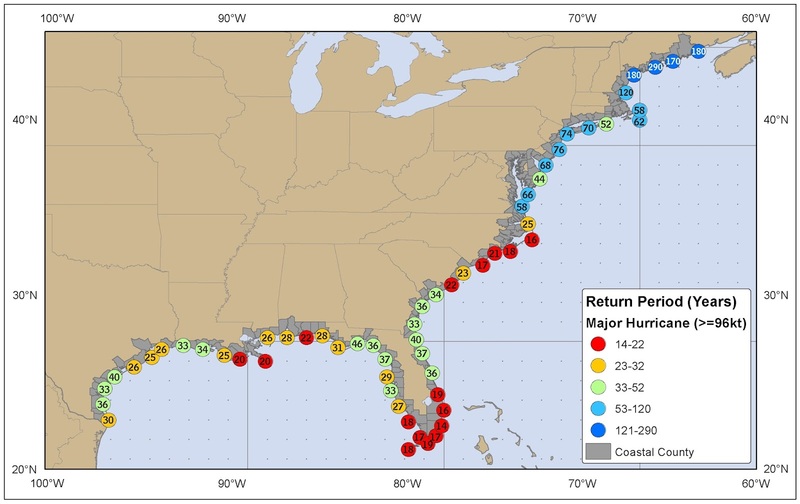 The "return period" for major hurricanes for areas along the U.S. coastline. Return period indicates how often major hurricanes have traditionally occurred in a location in terms of number of years between storms. 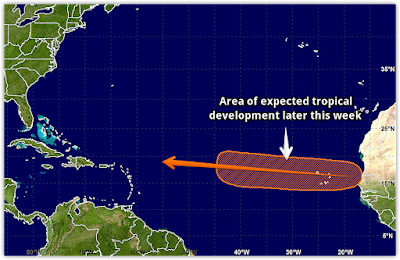 Graphic courtesy NOAA/NHC. So what's to make of the lengthy string of good fortune for U.S. coastlines? Likely, just that - good fortune. There is no good meteorological or climatological explanation for the U.S. not being hit by a hurricane for that long, with that many chances, in multiple weather and climate scenarios over the decade-plus long period of record. We can only hope that when the string is broken, we aren't discussing records in terms of dollars of damage and lives lost due to lack of preparation.